Bleecker Street releases Trumbo at AMC Village 7 and AMC/Loews Lincoln Square on November 6th, 2015. NYC MOVIE GURU: How did you find right balance between entertaining the audience and provoking them emotionally as well as intellectually? Jay Roach: It's a very serious topic, and it's something really interesting to me that by speaking up to say something that's less popular than other ideas---by dissenting--that you can somehow be branded as a threat and be tied to a larger threat like totalitarian communism. It happened not too long ago. It's also very possible that it will keep happening because it's a pattern in history---fear mongering is such an easy way for politicians to make a big name for themselves. On the other hand, these men were witty, sarcastic and sometimes abrasive in that way. They were smart-asses. In a way, it got them into trouble, but in another way, it made me connect with them more because their sense of humor was what got them through. They used their sense of humor to expose the absurdity and lunacy of the blacklist. I made sure to cast people who could play the seriousness like Bryan Cranston and John Goodman, but could also play the comedy like Bryan Cranston and John Goodman and Louis CK. Also, to have someone so soulful as Michael Stuhlbarg play Edward G. Robinson. I tried to use casting to set the tone, if you will and to find those balances. NYC MOVIE GURU: How did you come to the decision about how much the audience already knows about Trumbo prior to the film? JR: When I came across this story, I was suprised how little I knew about it. So, in a way, as an audience representative, which I think is part of a director's job description, I wanted to know and was very curious about Trumbo. I thought there would be a way in by connecting to personal issues first: family, a person love of storytelling, a person driven to be better and better at capturing your imagination and moving you. His drives are the same that I have or Bryan Cranston or the screenwriter has. I just tried to connect the audience to Trumbo in a relatable way. I also wanted them to say, "If you were in this position, what would you do? What's the right thing to do? Would you behave more like Trumbo or more like Edward G. Robinson?" and somehow have that suspense as part of the story. 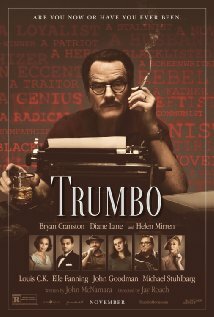 NYC MOVIE GURU: Trumbo is filled with humanism, a truly special effect that's true movie magic. Would you consider Trumbo to be a humanist? JR: Trumbo is called many things including a communist and a wealthy communist hypocrite, but I've read that many people who understood him well called him first and foremost a humanist. The reason why I care so much about the ideas in films that link us together and gives us a drive to actually work to make the quality of life better for each other. If you look at all of Trumbo's films, every single one of them that he wrote is fundamentally, deeply humanist. It's the opposite of something subversive. He wasn't interested in totalitarian communism as all. Roman Holiday is one of the most beautiful, loving films I've seen in so long. It was Audrey Hepburn's first film. Gregory Peck is amazing in it. It's a fairy tale, and one of the most humanistic fairy tales I've ever seen. Spartacus is also a very deeply humanistic. Dalton Trumbo was a humanist: that's what should be on his tombstone. NYC MOVIE GURU: Would it be safe to say that Trumbo was a peaceful warrior? NYC MOVIE GURU: If Trumbo were still alive today, what questions would you ask him? JR: I'd ask him, "How much did you struggle with the conflicting agendas?" He was an incredibly ambitious person and wrote dozens of screenplays. He had a really high life: he wore fancy clothes and had a little cigarette holder and a modest ranch in Southern California. Yet he would speak at a strike for set builders in front of Warner Brothers and risk getting arrested and beaten up. He would fight for fair wages for the bottom rung of the wage scale. So, he was incredibly contradictory. He loved to debate, and I love to debate. I do think that out of the clash of ideas that new ideas come about. I would love to ask him how he rationalized some of those. NYC MOVIE GURU: What purpose do you think hardships have in our lives? Would Trumbo have been able to write Spartacus without going through the hardships as a result of being on the blacklist? JR: I always say to my kids, "Everything good is on the other side of hard. There's nothing good that you get to without going through a hard, awkward, traumatizing thing." Trumbo might have been a better writer as a result of the blacklist, ultimately, than he was before the blacklist. Spartacus, I think, is a masterpiece of screenwriting. I don't know if he could have written that before the blacklist. Ironically, it's his most subversive film. The film that became the end of the blacklist that triggered the end and threw water on the wicked witch in a way. It's a film about a slave revolt and about sticking with your friends and not ratting them out while you're in the middle of a revolution. Yet, it was deeply human because what they were fighting against was horrific oppression of human beings. Slavery in itself is just an instantly recognizable tendancy in human relationships. What they were fighting for was incredibly noble. Trumbo was a mixture of righteous and humble. He was kind of arrogant in a certain way, but also incredible humble to lend money to friends and go and ask for money from friends too. You could see why an actor like Bryan Cranston would want to play him because there's so many different aspects to Trumbo's personality. But my favorite aspect is that he could find humor in the middle of all of it, and even laugh at himself. He was very self-deprecating. NYC MOVIE GURU: Where do you think that Trumbo's stubborness comes from? JR: He was full-on stubborn. It did come from the strength of his own convinctions. He mostly ended up battling with things that he was so sure were immutable, irrefutable rights. He was as intensely defensive about the constitution as anybody on the right who claims to be. He thought that the Bill of Rights was just like The Ten Commandments. So, he fought for them with the kind of zeal that a religious person would have about religion. He just never wavered. In a way, that sort of makes him an atypical character in literature or drama because, often, stories are about a character that changes. Often in literature, stories are about characters who are tested and tested in their will is constantly challenged and they ultimately stick to their fundamental principles even as other people are selling out around them. His stubborness came from a true sense of what was right even when he was almost alone with some of those convictions because people were quick to throw each other under the bus whenever there was a sense of fear. NYC MOVIE GURU: Which films would you have have liked to direct from the Golden Age of Hollywood? JR: I love actors, and like the old school of acting too which was a willingness to be preachy at times---to go find reality in it, but to be a little bit theatrical in the way that Trumbo was. I would have loved to direct Spartacus. Every film that Trumbo and Hitchcock wrote I would have loved to direct. NYC MOVIE GURU: What do you think would make a great double feature with Trumbo?